With the animation industry in Ireland experiencing strong growth in Ireland and internationally, four women in the industry discussed the opportunities and challenges facing the sector today. Chairman of Animation Ireland and founder of Moetion Films Moe Honan started working in animation just under 20 years ago. She found that she naturally gravitated towards the industry, preferring the longer working and collaboration projects. However she admits that there is still more work to be done to get more women directors and writes into the industry and steps are being taken where women are more consciously doing that. On a personal level, Moe talks of her most successful project ‘Two by Two Ooops! The Arc is Gone’ as being a career highlight. The film was released in Ireland and UK in 2015 across 461 theatres. Meanwhile on an industry level, Moe says that the players involved in the Irish animation industry are all very conscious that the fruits of the last 20 years have borne out. 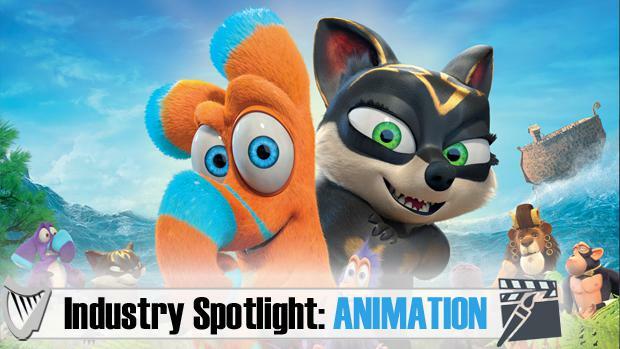 Talk turns to the challenges facing Ireland’s animation industry, and Moe says that the issue around staffing is “definitely something we are working”. There is today she says a “massive opportunity for Ireland” in the sector. Deirdre started working in LA just over 20 years ago working on HBO shows. She then worked with a feature film company in LA, before she moved back to Ireland in 2001 started working in animation here. After some years working in the industry here, in 2013 she, along with her business parter, made the decision to set up the production company, Salty Dog Pictures. Most recently the company animated a show with Tom Hanks for Saturday Night Live David S Pumpkins Halloween Special. “We have just started production on a new show for Warner Brothers – can’t say too much about this yet,” she says. She also highlights the benefits of working for smaller companies, as it enables you to experience every area of the production, something she says is essential if you are going to have your own company. In terms of career highlights, she lists making her feature film, ‘Between the Canals’. The second thing she lists is setting up her own company. However, she says that for now there is a lot being done for a small country and it is only growing. Deirdre also mentions that the problem of holding onto the right people can be a challenge for smaller companies. Niamh Herrity doesn’t have the animation background that one might expect from the co-founder of Pink Kong Studios. Her background is in fact in business, marketing, PR, and event management. Initially when the two set up the studio they were doing corporate work. But since then they have stepped into the created of TV and film work, this year created Ireland’s first virtual reality (VR) animation film. In terms of career highlights, Aoife says that ‘The Aurora’, Pink Kong’s VR film, gave them an opportunity to explore a different way of story-telling. In addition she cites getting nominated for an Augie award, while their film Departure got nominated for an IFTA. We discuss the challenges currently facing the industry and, like many others, Aoife highlights staffing as being an issue. She also says that it is a very expensive industry to be involved in. Similar to Niamh, Louise’s background is more business than animation. The qualified accountant always had an interest in the Arts and wanted to work in a creative industry. She worked in Live Action for a period of time, before she got the Brown Bag opportunity six years ago, where she now heads up finance and business affairs. Brown Bag has studios in Dublin, Toronto and Manchester, as well as an office in LA. The studio has created a number of much loved TV shows including Doc McStuffins and DanielTiger’s Neighborhood. The company has been able to maintain long-term employment, with about 270 employees in Dublin, 120 in Manchester, and around 300 in Toronto. However, the industry-wide problem of staffing is also an issue for the company. Today Brown Bags has about 40-50 positions open in Dublin and Manchester, while about 65pc of the Dublin artists generally are international artists. Louise says that the company is looking to open a conversation with Universities around employee skill set. For Louise, the biggest reward has been involved in a company and industry that is scaling and growing and be able to have input into that. However, on the matter of challenges, again she says that it goes back to employees. Ellie Donnelly For Irish designer Emma Manley success has not been easily won, but hard work and getting the best from internships has paid off for the recently crowned VIP Irish Designer of the Year. Gavin McLoughlin It has been a frightening time for British retail. Last Thursday, Poundland became the latest in a slew of major players to announce materially bad news, with around 100 stores set to close.